I was going to title this post "A Winter Wedding Fail", but there was in fact nothing wrong with the wedding we were invited to—we just never made it there due to my own stupidity. Maybe I should start at the beginning. Two things happened at roughly the same time recently: a workmate gave me some sourdough starter made from whole spelt and pineapple juice, and a couple of other friends invited me to witness their exchange of vows, for which we were asked to bring some finger food, instead of a gift. I thought I could work those two events together, by baking my first sourdough ever. Because you can't just have bread on its own, and I wanted something that looked and tasted good as well, while more or less sticking to the basics, I decided I was going to make this amazing-looking hollowed out loaf, secretly stashed full of egg sandwiches inside. 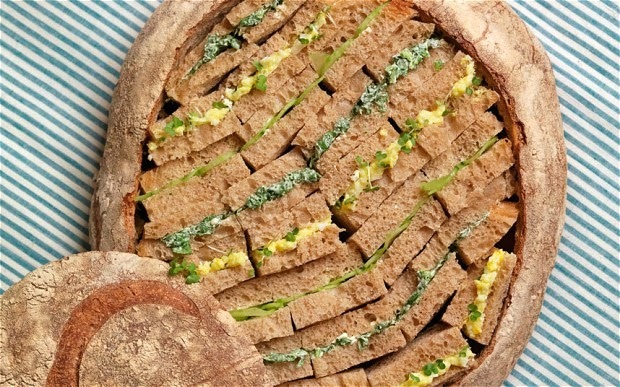 Gorgeous sandwich loaf from The Telegraph. To make it really stand out and show that I had put some effort into it, I would decorate it with some baked dough shapes too, a la korovai from Ukrainian weddings (though the couple had nothing to do with Ukraine). These figurines apparently need at least a day to dry out, so I started work on them straight away. The bread, on the other hand, I wanted absolutely fresh. I went with Suburban Grandma's recipe, as she shows you how to make the traditional shapes. It produced a dry mixture, and I added more water, before I had tried to fully incorporate all the ingredients together. I turned it into a beautifully smooth and pliable dough, before I realised that this was completely wrong. My birds couldn't hold their heads up, ended up with flat undersides, and I needed to prop up the one with spread wings. I imagine if I had stuck to the recipe, it would have been easier to shape, like Play-Doh. Perhaps it would have been more difficult to stick the wings to the birds though. Birds made from soft dough. I let these shapes dry in a pre-heated oven and turned the oven off while I did errands. When I came back, I remembered to glaze them with egg white, and baked them till the edges were browning. I watched over them and covered up the wing tips with foil when it looked like they were darkening too quickly. I was quite pleased with the results, though the skin on the birds cracked, and some parts looked greyish rather than golden. I pushed toothpicks into each piece while warm. Not bad for a first attempt. My dough birds and rings, resting on shot glassees. At this point, my other half pointed out that I was going to great lengths for very little gain, and was I sure the ceremony would be on Sunday? Yes, I thought—I had just checked my calendar yesterday, and the event was definitely in the rightmost column. Then it was time for bread-making. I had already mixed together the "sponge" (I still think of cake when I hear this word in terms of baking), when I realised that a) egg sandwiches are normally made with the most boring soft white bread, and might not go with sourdough, b) that amount of dough was not going to turn into a large enough loaf for me to place more than a couple of sandwiches inside, and I didn't have enough starter to make more, not to mention that c) as I had never made sourdough before, this could well be a disaster. I immediately put together a double-sized batch of a tried-and-true no-knead bread recipe instead. It was wetter than I remembered it to be, but I didn't put in too much extra flour, as it's supposed to be on the sticky side. I left it overnight, hoping it would get better, but there was a distinct lack of magic here. After sprinkling flour over the mixture, turning it out onto a floured surface, and repeating the process a few more times (while trying not to squeeze all the air bubbles out), the dough still threatened to slowly escape. I decided that the only way to make a bread with any height would be to bake it straight after I tuck the edges to the bottom, before it had any time to flatten out. And to avoid any dripping in the oven, I swapped to using a roasting tray rather than a baking sheet. I wrapped the ball around itself a few more times, popping the giant air pockets that developed from the exercise, and slashed the top of the loaf before baking. You will not believe the pain this bread brought me, literally. I had previously baked this in a covered Pyrex bowl. But with twice the amount of dough now, this was no longer possible. Instead, I opted to pour boiling water into the bottom of the oven tray to generate steam. It may come as a surprise to you, but steam hurts. My hand holding the vessel of water pulled back involuntarily, splashing boiling liquid onto my leg and the floor. I ignored the burning and tried again, this time not caring if I hit the bread. The end result was beautiful, if I may say it myself—at least, when viewed from the top. The bottom of the bread was unfortunately a bit wet, with damp flour caked to the bottom, no doubt because of the water I had thrown in for steam. I turned the loaf upside down, and baked for a bit longer. The underside of the bread was caked with excess flour and slightly damp. The trouble was, it was already the morning of the wedding, and I had not allowed for enough cooling time after the extended baking time. I quickly roped in an extra pair of hands to help make the egg filling, while I fanned the bread and attempted to cut it while slightly warm. Making of the egg filling. Carving sandwich slices out of the innards of a loaf is not as easy as you might think, especially when it is round. You end up with mismatched lengths of bread, and there is no easy way to detach your slices from the bottom of the shell, so every piece is left with ripped edges. We were in a hurry though, so didn't have time to worry about aesthetics. Egg sandwiches in my homemade loaf of bread. I quickly let the bride know we were running late, put the loaf lid on, arranged my figurines on top, and jumped in the car. It wasn't until nearly an hour later, when we arrived at the venue with no cellphone coverage, that we saw the empty parking lot and realised the terrible truth—we had completely missed the ceremony, and not just by a little bit. This was no laughing matter, but what was there left to do? We sat at the beach and ate a couple of sandwiches before driving sadly and incredulously back home. This post is part of Our Growing Edge, a monthly blogging event aimed at inspiring us to try new things. This month, it is hosted by Ash from Organic Ash. What a pity you missed the wedding after all that effort! Those figurines looked impressive though. Thanks - it was totally embarrassing, but it did give me an excuse for playtime in the kitchen. Oh no! Did you get the time wrong or was the ceremony and feasting done in record time? The perils and pains of a home cook! It sounds like you sacrificed a lot for this bread. I hope it was delicious. At least you got to share your story. I got the day wrong - I completely missed the fact that the rightmost column in my calendar is for Saturday, not Sunday! Not sure how I did that - I guess I just made an assumption and ignored everything that contradicts it.